March 12, 2012 — If the Board of Trustees’ intent was to further inflame alumni and friends of the University by issuing today’s statement, then, by all means: mission accomplished. Although referred to as a “report” on the openness.psu.edu website, it is anything but. The Trustees’ rehashing of poor excuses for lack of due process didn’t hold water when the statements were originally made, and doesn’t hold water today. We find it unacceptable and appalling that the Board of Trustees considers issuing this information to be meaningful, or positive for the University, in the least. At a minimum it is selfserving and demonstrative of the Board’s total lack of leadership. At most, it is reckless to again unnecessarily thrust the University into the media, creating yet another negative news cycle for no good reason. Penn Staters for Responsible Stewardship is particularly outraged with the Board’s explanation that they relied primarily on the grand jury presentment in making their decision to fire Coach Paterno. When given the resources of a 28-page document written by the prosecution with the goal of obtaining a trial, or the complete, unbiased official grand jury report, the Board of Trustees today freely and proudly admitted that they chose the short cut. To make an academic analogy, the Board of Trustees elected to rely upon the Cliffs Notes written from the perspective of the prosecutor, and in doing so, forfeited their opportunity to obtain a complete and objective understanding of the complex situation at hand. This decision – coupled with ignoring the opportunity to interview Coach Paterno firsthand — is further damning evidence of the Trustees’ glaring lack of engagement and inability to lead the University. Penn Staters for Responsible Stewardship can no longer tolerate these ongoing egregious errors in judgment, and therefore calls for the immediate resignation of every member of the Board of Trustees. Penn Staters for Responsible Stewardship has endorsed Mark S. Connolly, Barbara Doran and Anthony P. Lubrano in the upcoming Board of Trustees elections. 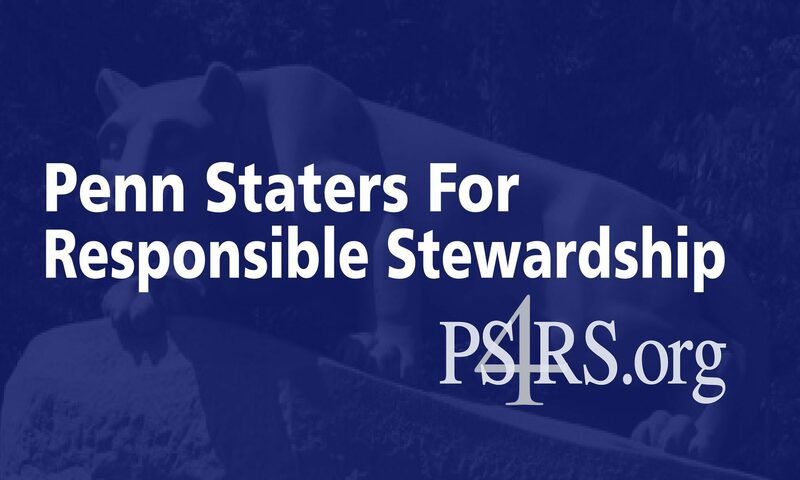 For further information on Penn Staters for Responsible Stewardship, please visit PS4RS.ORG, email ps4rsinfo@gmail.com, search “WE intend to vote out the Penn State Board of Trustees” on Facebook. Follow us on Twitter at PS4RS.